250 PTMEG is a liquid to waxy white solid, composed primarily of polytetramethylene ether glycol, that melts to a clear colorless, viscous liquid on a wide temperature range near room temperature. It reacts with isocyanates to form a variety of modern polymers, chiefly polyurethanes. 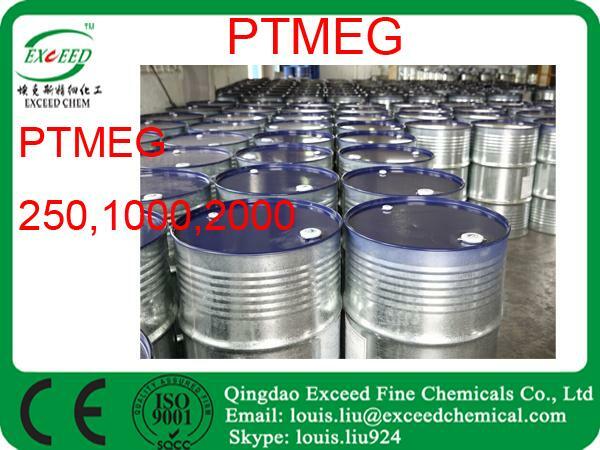 PTMEG used in numerous applications, such as industrial wheels, recreational wheels, industrial belts, hose and tubing, films for lamination, tank and pipe liners, apparel coatings, construction coatings, security glazing, spandex fiber, and synthetic polyurethane leather. Other molecular weights like 1000, 2000 can be made on special order; for further information, customers may contact us for further information.